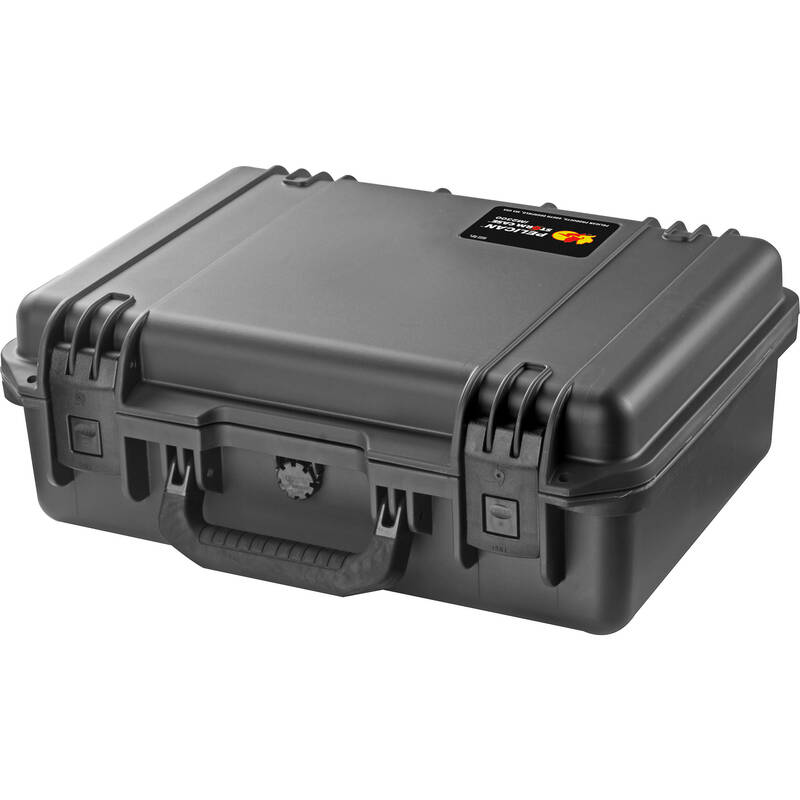 The Pelican iM2300 Storm Case with Foam (Black) is an injection-molded case made of HPX high performance resin, that is virtually unbreakable, dent-resistant and shatter-resistant. It is tough, rugged, lightweight, airtight and watertight. There is a permanently attached Vortex valve that automatically adjusts air pressure without letting in water, and won't unscrew from the case. Press & Pull latches open with the push of a button, yet stay closed securely under impact or stress. The case has unbreakable molded-in hasps that allow the addition of standard size padlocks. It has hinges with integrated feet that hold fast under impact, and create a flat surface for upright stability. It is carried by a double-layered, soft-grip, solid-core handle that provides strong, durable comfort. Box Dimensions (LxWxH) 19.0 x 14.0 x 7.5"
iM2300 Storm Case with Foam (Black) is rated 5.0 out of 5 by 23. Rated 5 out of 5 by Ed from Great Choice ! It is a great size for my Full-frame DSLR, two lenses and a 2x converter and eye piece and a 4x5 box for misc. The great design latches are very smooth and easy to operate and a Very comfortable handle. I never have to remember to open or close the vent...it is automatic! I do own another Pelican case, this is my favorite. The only thing Pelican could improve is make the foam insert a lot denser...I would not mind the added weight. Rated 5 out of 5 by Brian from Great Case! Been meaning to buy a case for a while. This case is awesome. I own a few other Pelican cases and I can say I like this case better. Pelican recently bought Storm Case so you know the build quality is solid. The one reason I wanted a Storm rather than a Pelican is because of the clamps. We call Pelican latches knuckle busters because we have busted our knuckles more than a few times. But with Storm, the clips are solid, yet easy to open. I highly recommend this (or any Storm) over Pelican. Rated 5 out of 5 by csciguy8 from Rugged, ease to use, foam needs patience Bought this a while ago and really love the easy to open latches, handle, and general feel of ruggedness. Originally used this to transport a fragile headset microphone, but then changed uses, bought new foam, and am now using it for my Nikon DSLR and two lenses. Really great, but working with the foam takes some patience if you want it to look good. It's really easy for things to look ill-fitting or rough around the edges if you rush things. Some tips for the foam: - Measure everything out before you start. Once the foam is plucked, you can glue it back, but it'll never look the same. I had an old set of foam to play with and it helped immensely. - Leave at least 2-3 cubes between your gear. Otherwise, it won't have very much structural support, and everything will bend too easily. - Add space for your fingers / thumb to access the gear. Otherwise, it'll look nice, but be hard to get at. - Think in 3d. There's only two layers to play with, but you can always get some small scissors and cut your own depth to give a multi-level appearance and to make sure your gear rests right at the top (rather than sink in) Attached is a pic of my setup, and I spend too much time (4-5 nights) tinkering and obsessing about the design. Hope it helps. Rated 4 out of 5 by Mike from Great airline under seat case I use this case as my under seat personal item when flying. It fits my 15 inch laptop, 3 hard drives, and cables. I use the lid space for papers and files. If you configure the foam well, you can get all these items in here. I only gave it 4 stars because I wish pelican made the holes for the pad locks a little bigger, as they are on the pelican air models. Rated 5 out of 5 by Andrew from Exactly what you need! I am a student photographer/filmmaker and own DSLR equipment for shooting. I own a Canon 7d and few lenses. This case perfectly fits the camera body a couple lenses and a shotgun mic with space to spare! It makes it to pack up and move from location to location on foot or in a vehicle. I feel more secure with transporting my equipment now that I own this case. Rated 5 out of 5 by Cody.Girl from Great for field work! I've purchased several of these items to store field gear for a research project. The case is excellent for a storing a tablet computer, camera, GPS unit, and associated cords. The tear-away foam allows you to customize each case for your personal gear, and the rugged exterior provides a high level of protection for expensive equipment. Rated 5 out of 5 by frank D from too tough great product, too tough to be true, the foam work well as a damper for shocks, i bought this case to carry my photo gears trou airports I(fits 2 body, 24-70, 70-200, 14-24 and a few gears)i found the case to be too glossy for my taste and i dont wanted to atract too much attention, nothing a few pieces of sandpaper wont get rid of.